I received the most wonderful email this morning from a past MQX student, Linda James. 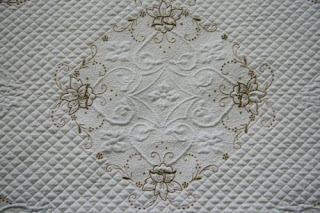 She provided a link to her website where she shared her first Linen Wholecloth Quilt that she started in my class a couple years ago. Amazing job Linda!!! Thank you for sharing! 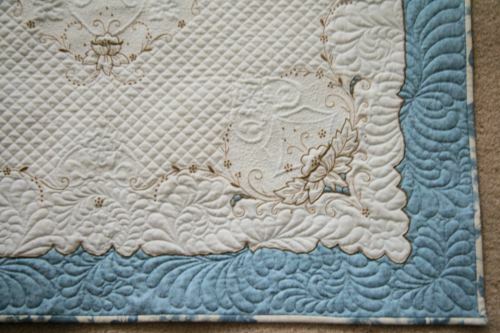 "My quilt, Anna LaFrance, is actually a small tablecloth which has been sewn to the blue fabric and quilted on my longarm. I learn this technique from Cindy Needham, while attending MQX several years ago. It’s taken me all this time to finally try what I learned in Cindy’s class. Now I’m knocking myself in the head wondering why I waited so long. I absolutely love the result. 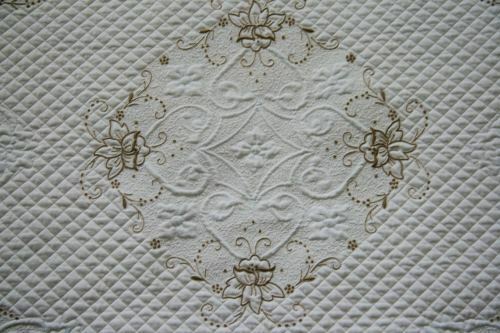 I have always appreciated the old beautiful linens but they just sit in my linen closet or in boxes in the attic. Now they can come out of hiding and I can enjoy them everyday. BTW, Cindy in an awesome teacher. If you have an opportunity to take a class from her, do it! I used parts of a stencil by Cindy, freehand feathers and crosshatching. 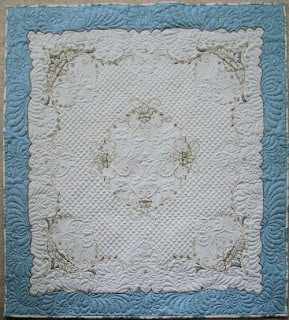 The motif and feathers are quilted in a light blue Sew Fine thread while the crosshatching and very small stippling is in off white Sew Fine thread. 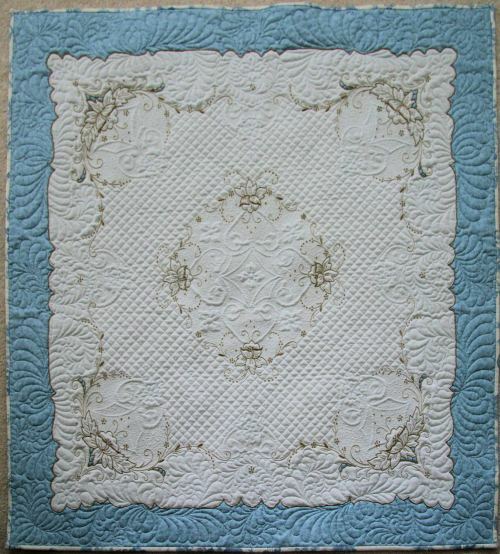 There are two layers of batting, Hobbs 80/20 with Quilters Dream Wool on top. It’s named after my husband’s grandmother. She has such a pretty name. The label is an old napkin (???? ), a set of which were given to me when I was a child. That is a story for another day. Of course, I had to put a picture of Anna on the label. The sleeve is a piece of lace. I can’t wait to try another one. Maybe the next one will have beads on it. Linda - absolutely beautiful!!! I saw your post on MQResource and your blog as well - lovely. And for those procrastinators who keep saying they are going to take Cindy's class - just do it!! You'll never look at an old linen the same way thanks to her genius. 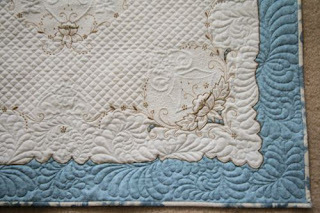 Of course if I could step away from customer quilts to do one of my own - well, that's for another day.